Hope you’ll enjoy this one as much as I have! 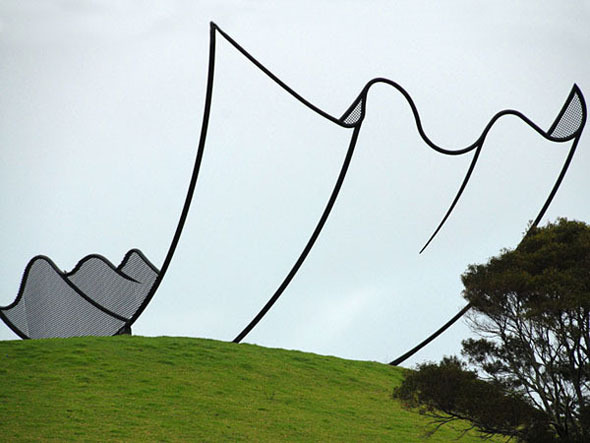 What appears to be a drawn piece of paper is actually a construction made of welded steel. Be sure to jump inside this post for more different angles. 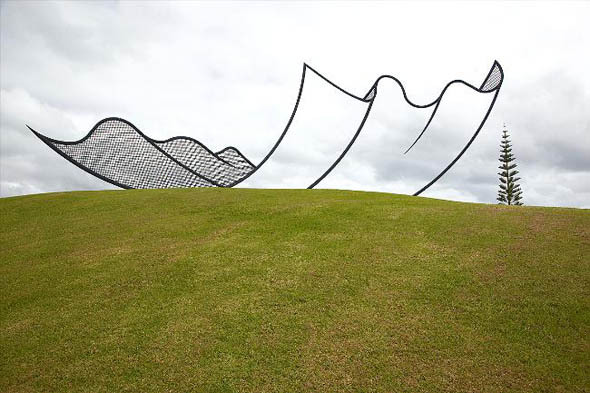 Piece of art you see was created by Neil Dawson, who named it Horizons. 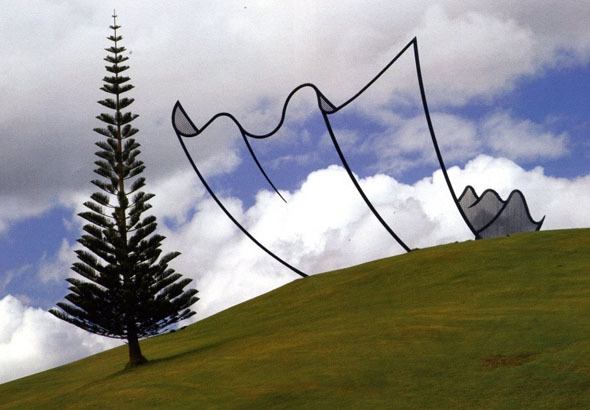 It is located in New Zealand on “The Farm,” a large private art park owned by Alan Gibbs, a New Zealand businessman, entrepreneur, and art patron worth about $450 million dollars. I LIKE THIS ONEEE!! THIS IS PRETTY INTERESTING. ALTHOUGH IT LOOKS LIKE IT WAS DRAWN ONTO A PICTURE. Wooooooowww, I wish I had something like that around here! Sweet! Probably my favorite posting from this site in a while . . . .
Oh Man…that’s some great work! It’s really fascinating I can’t see it as a steel construction but as a comic script.Really amazing! i luv this! i want 1 in my yard too, lol. Looks like a hanky just touching the ground. Really neat! I don’t believe this one it has to be fake. The opposite view is an exact mirror image, even the trees are different. That’s a mighty big bed sheet–and transparent, too. It has some interesting possibilities, eh? i think it’s fake,but possibly real…. WOW!! This one IS fantastic! also imo it’s a fake: the portion that is transparent in the first image is patterned in the second. The second image seems a mirrored version of the first, but the trees are different, as already observed by Russ Welch. why is it a different tree in the forground of the first image to the second and third image? Do you think it’s fake? It’s not a mirror image. It’s taken from the other side of the hill, hence the different tree. I just dont get it AT ALL even if is real i dont see how it can be art that would cost that much thats just me maybe I’ll come back and take a 158 look at it. Mm. Semantic illusion of the day. No JD, I’m pretty certain it isn’t the artwork that is worth $450m. But I’m still not certain whether it’s Alan Gibbs or his park which is worth that much. Vurdlak? as a pro illousionist i say that its not good but ok im sure you can do better! Very cool! Wish I could see it in person! Maybe one should ad for anyone who didn’t get it: the construction is somehow two dimensional. So that might be confusing. It looks like a three dimensional thingy but it’s just like a drawing (that is made to look three dimensional). If you would look at it from the right angle it would only look like a bar. It seems really fake. I searched the web and only two images appear. This is the only site I saw with the 3rd image. Pretty weird that there so few pictures out there. Pliz post links if you find anything new. I thought it was fake at first, so I started looking it up. It’s real. It’s too bad The Park isn’t open to the public (except for fundraisers), would be an awesome place to visit some day. The center image has been flipped left-right (mirror imaged) to create a more dramatic presentation. The lone pine tree nearby is the same in both photos, but the curve of the trunk is also flipped left-right; a giveaway at the ‘hoax’. Nevertheless, it is a delightful work of art. @ Astro: the tree is missing the bottom half of it’s trunk, it is on the other side of the hill, the clouds look completly different, the grass is different and grows in a different pattern, the hill itself is shaped differently, the “image” covers a larger area, and the tree’s branches are positioned differently., first two pictures are from 3/4 views, third is straight on from a side. my new favorite illusion. If its not real and just a concept, it could certainly be built. As soon as I realised it’s a 2-D structure rather than a 3-D one, I understood how it works. It took me AGES, but now that I understand, it really is quite cool. It is clearly faked In the second and third picture it is transparent but in the first one it only shows white and even if there was a perfect cloud behind it it should still show the framework of the back part which is grey cross hatching but it just shows white. Photo-shopped. Pretty pathetic if you ask me. This is fake, in the second picture, it shows the clouds. The clouds wouldve moved eventually and it wouldnt match the “sculpture” anymore. It doesn’t make sense, as much as I want it to. You wouldn’t be able to see the clouds if it was real – look on the opposite side where the frame is shaded and then compare those shaded bits from the different viewpoints. what im confused about if why the back of the sheet is coloured/pattern and you see this in all 3 pics yet you dont see the same on the front of the sheet and its see through which to me make me think its fake. some poeple have said its a 2D art work then how can there be a back to the sheet if its just afew steel bars? if some can explain this please do. It’s not fake,by the way,and cool! No, because, if you look at all the pictures, even though the angle is change, it still looks like in the other pictures. The artist is just fooling you as much as he’s fooling me. Just you’re too dumb to think the last picture is fake. only a genius mind could create something like this! Apparently these are *three different statues*. Almost got me with this one. Nice try! I really wanted this to be true, but after a little analysis there’s only one conclusion: F A K E !!! the pixellation proves it’s fake. come on guys.